Celebrate Earth Day with Worms! What better way to celebrate Earth Day than to honor the creatures who move the earth under us and are the caretakers of all things that grow in the earth? I have a tradition that we always have a difficult book that we read together as a family. The last two books we read were “The Physician” by Noah Gordan and “The Mists of Avalon“. One year we decided to try something a little different. We chose a book and we included the characters in the book (the earthworms) in our storytime. I was inspired by Linda Dawkins in New Zealand to start reading the book “The Earth Moved” – a book all about earthworms and the amazing powers they have! I read it outloud to the kids (re-wording some of the difficult parts) and we were all awed by the book together. 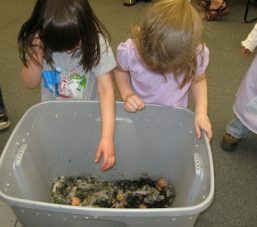 The most fun, however, was that the kids decided that earthworms needed to be part of the storytime. So every evening when I got out the book, The Earth Moved, the earthworms we kept in our “compost bin-earthworm farm” were moved to the livingroom to be played with by Sunii and Sofi. It kept them focused on the more difficult material in the book in the beginning but over time it just became more fun! Earth Day is the perfect day to start this tradition with your family. And also the perfect time of year to start your own Earthworm farm (to be moved outdoors later). For more gardening and Earth Day inspirations (including our instructions on how to create an Earthworm farm) you can check out the Earthschooling Third Grade Curriculum.